At Long Last, Is This the Turning Point for Corning Stock? Corning CEO Wendell Weeks thinks so. Should you? 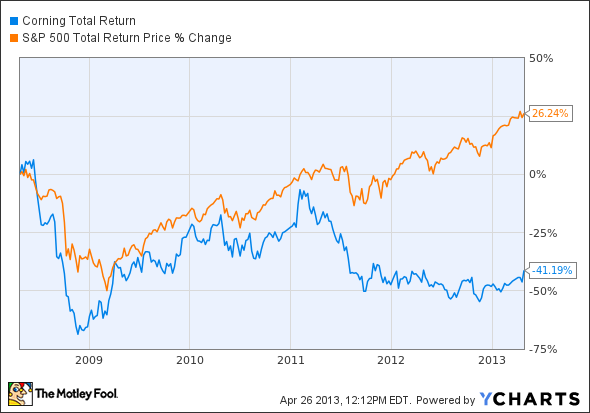 There's no denying the past five years have been tough for Corning (NYSE:GLW) shareholders. Even so, the cash-rich business still managed to remain solidly profitable all the while, and seemed determined to reward long-term investors through its huge share repurchase programs and a steady dividend. Corning takes pride in its ability to innovate through continued research and development and survive no matter what technological revolutions come its way. Sure enough, Corning CEO Wendell Weeks is often maligned by Wall Street for his stubborn refusal to manage the company around quarterly results. But the question still remained: How much longer would investors need to wait until Corning stock finally turned around? As it turns out, CEO Weeks thinks it already has. In 162 years, Corning has been through recessions, depressions, world wars, industry meltdowns, and numerous evolutions driven by changing markets. Corning is no stranger to tough times, and the leadership team has worked hard to ensure that the company is stronger than any challenge we face." Keeping in mind Weeks' aforementioned notorious refusal to manage around earnings, then, I'm inclined to trust the man when he says Corning stock has turned the corner. When all was said and done in the first quarter of 2013, Corning managed to achieve sales of $1.81 billion with non-GAAP earnings per share of $0.30. While revenue fell short of analysts' estimates of $1.96 billion, the company was significantly more profitable than expected considering those same analysts were looking for earnings of just $0.24 per share. Corning scientist inspecting display glass, Image source: Corning. Going forward in Q2, Corning stated that it should continue to benefit from stable LCD glass share, with price declines continuing to decelerate, while Telecommunications sales should improve by about 20% sequentially from the first quarter. What's more, Specialty Materials sales should also improve sequentially in the 15% to 20% range thanks to increased demand for Corning's Gorilla Glass, and the Life Sciences segment will see sales increase by a whopping 35% to 40% year over year from Corning's recent acquisition of Discovery Labware. Management also told investors to expect equity earnings from Dow Corning's silicones business to rise 20% year over year in the second quarter. Finally, and perhaps best of all, Corning once again increased its quarterly dividend by a penny to $0.10 per share and authorized a new share repurchase program to allow them to buy back up to $2 billion in Corning stock by the end of next year. Thankfully, investors Wednesday took note that Corning's business seems to be firing on all cylinders and drove the price up 5% by the end of the day. Despite the pop, however, I'm convinced Corning stock has plenty more room to run over the long term.